Discussion in 'Pregnancy Club' started by Wobbles, Aug 8, 2007. 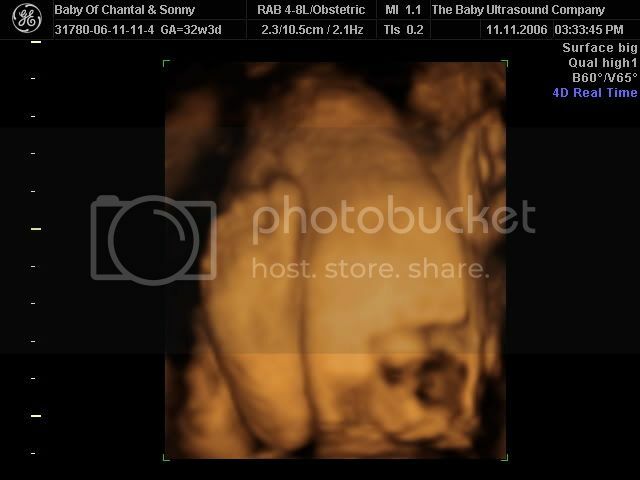 When did you girls who have had a 3d scan get yours? 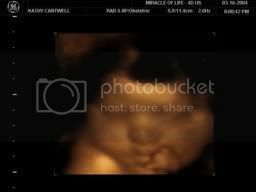 I looked into getting a 3/4d scan with Olivia and Babyscanning in Glasgow told me the best time is around 28-30wks as the baby is a good size and well formed then and able to do lots of things like finger sucking etc and not too big to be squashed up to block a good view. 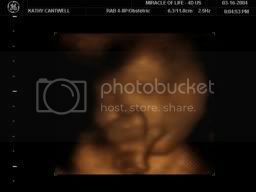 We didn't go for one in the end as was strapped for cash after paying for the 20wk scan. 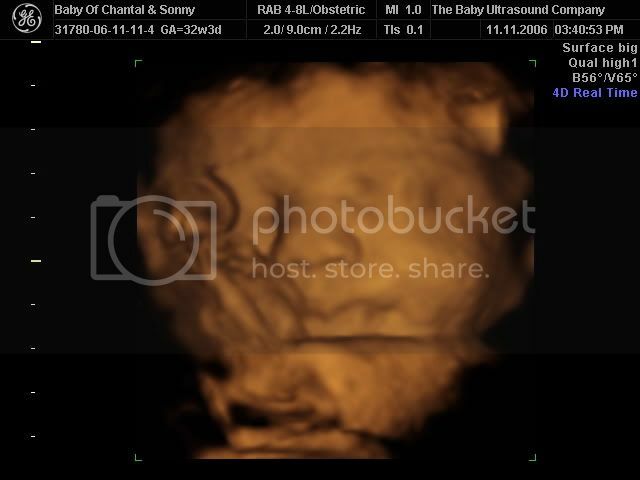 This time round I was lucky we got a quick look at the baby in 3/4D and I must say it was really lovley seeing the baby in more detail and in dimension. I had mine really late, don't remember exactly. Think it was in the November and Bethanie was born in December. Some of the photos came out a bit crappy, but some amazing..
Can't remember really, but we went earlier than you would with one. I'd hang on as late as you can cos they look more like babies the later it is. BUT make sure you allow a couple of weeks grace just in case there is a problem getting good shots of bubs and then you can have another go (they shouldn't charge you if they can't get pics). 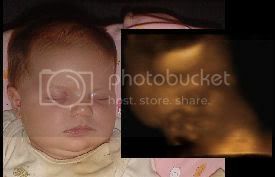 I had mine at 27 weeks, which is around the time they reccomend. 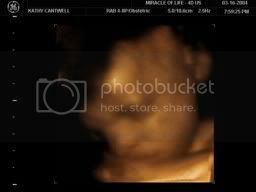 Best time is def between 27-32 weeks apparently as there is more fluid around the baby which allows for clearer pictures. I left it too late, so the pics weren't as great. 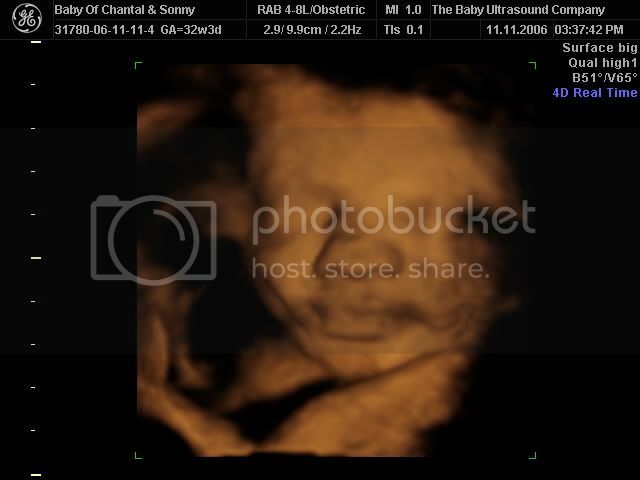 We had Rebecca's done at BabyBond at 24 weeks and paid £195. Couldn't afford it this time round so went for a sexing scan at BabyBond at 17 weeks for a cheap £75! Blimey! Mine is £85 with 4 pictures? I see one package is £125 Kx? It appeared to me that he had recorded 4 bits from the scan and looped it until it made up 20 minutes. I was also dissapointed at the fact that baby was sleeping... smiled a few times but thats about all. 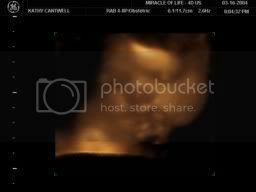 Heres my pic from 26 weeks - I definitely recommend that you wait til around 26+ weeks, the 18 week scan I had wasnt very good. I got a disc with 80 images, a 20 minute dvd, 1 large photo, 6 small pictures, and the video was put on the internet- it cost £75. We got the bonding scan, option 1. It was a good idea at the time!